I have been so busy this month I nearly forgot to post something. I do have some paintings to show you but for now: Here is a silver pendant I made for a friend’s birthday. They had a whip round at work to contribute to the materials and then we agreed on a design. She makes it hard for me because, although she likes jewellery, she doesn’t often wear it and so I find it hard to pin down her style but I hope I got it right and she will wear this. For the cherry bough I took silver scraps and dust and carefully fused them together to form twiglets before soldering them together with hard solder into a little branch. I then cut out the blossoms from silver sheet and gently domed them before adding a silver bead to each centre with medium solder and soldering them to the branches using the same stuff. I then used easy solder to add the ring for the bail to go around. 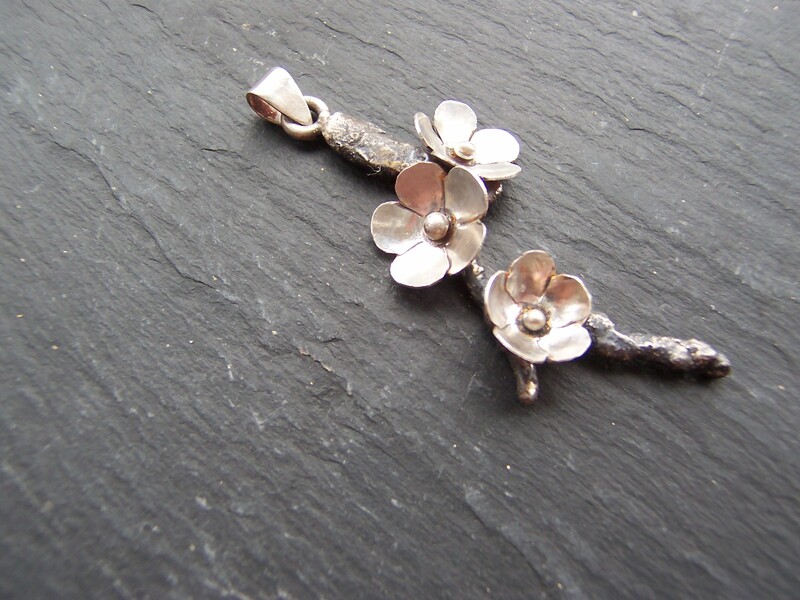 Finally I oxidised the twig with liver of sulphur and gave the flowers a polish with a mop on my mini drill. I don’t know the word for it but I think the Japanese probably have a term to explain the poignant contrast between something old like a venerable fruit tree and the fresh young blossom it produces in the spring. Whatever the word is, that was the sentiment and look I was aiming for.